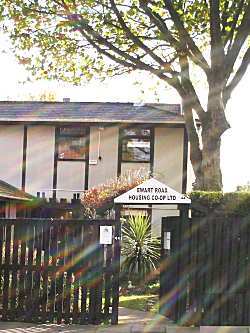 Ewart Road Housing Co-op does the housing and estate management for the Ewart Road Estate. Although we are managed by our residents, we are funded by Lewisham Council, for whom we act as a managing agent, and employ professional housing staff to provide the housing services and run the co-op from day-to-day. The office is on the estate itself, at the corner of Wastdale Road and Dalmain Road, and so is the hub of the Co-op. The staff provide a full housing service: repairs and maintenance, rent collection, dealing with enquiries, caretaking, grounds maintenance, gardening and so on. The office is also where most sub-committee meetings are held, whilst the adjoining Community Hall is used for the full Management Committee meetings and for General Meetings. The office is open to residents all day Monday and Thursday, also Tuesday and Friday mornings. It is closed to callers on Wednesdays. Outside of these times, you can reach us by phone, fax or contact us via this website or by email (see the infobox on our homepage for contact info). The co-op also retains the services of a bookkeeper to handle finance work. The co-op’s accounts are prepared and audited annually by independent auditors. In addition, the co-op’s performance is monitored monthly by Lewisham Homes. Any costs which are to be recharged to Leaseholders also have to be approved by another firm of external auditors appointed by the London Borough of Lewisham.